An otherwise decent blog I found today was engaging in what I think is a pathetic, desperate-seeming practice – social network overload. 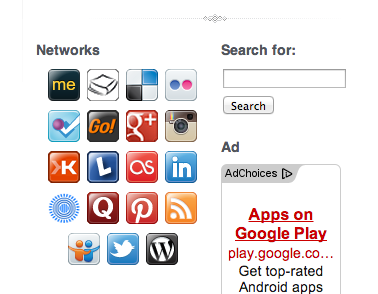 This well-meaning blog author is taking a good concept way too far – 19 social network icons. If you’re a blogger or share some responsibility for a website, you have undoubtedly heard that it’s great to have social buttons on a website. 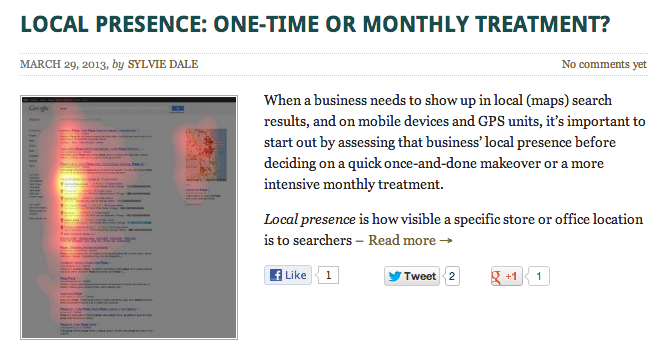 When updating our Advance Digital Search & Social blog, we also have icons for our social outposts, and in addition, we include sharing buttons with each article to make it easy for our readers to share with others. At work, we all contribute to a thought leadership blog which includes 3 sharing buttons under each article. I won’t embarrass this blog author by revealing the name of the blog, but in this case, LESS IS MORE. This vomiting out of social media icons comes across as arrogant and can overwhelm your readers. I personally belong to dozens of social networks, but I know better than to post every icon on my blog. This has the effect of watering down the effect as people struggle to choose a network on which to connect with you. So what number is a good number of social icons to display? Well, that depends on your strategy. Take the time to map out who is your target audience, how you plan to connect with them, and what tools will be best to use. Once you know that, you will be able to apply focus to your choice of social icons on your blog. If you are a photographer or artist and you share a lot of your work, Pinterest, Instagram and Flickr might be good choices for you. If you are a thought leader in some form of arts or sciences, you might appreciate the niche-development capabilities of Google+. If your work is touchy-feely, you might want to include Facebook. But resist the urge to be all things to all people – it will just come across as desperate. The usual social networks are Facebook, Twitter, Google+ and YouTube. LinkedIn is another good one, but I would suggest starting with only 4, to keep things simple. 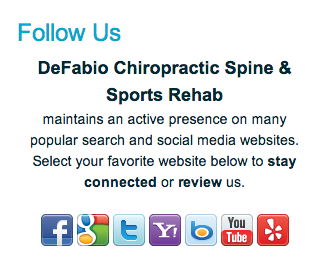 Here is an example from my chiropractor, DeFabio Chiropractic, who does a great job of connecting with the Berkeley Heights community in person and in social networks. My chiropractor has chosen to connect with his diverse audience on 7 social networks. Perhaps the most important criteria for which networks to include is this – if your readers stop by your website and then visit each of the social networks that have buttons displayed, will you be embarrassed by what they find? In other words, as a busy business owner, can you KEEP UP with all those networks so that your visitors see important, current messages from you on any of them that they might visit? A social profile is not a billboard, so businesses that treat it as such get ignored by the visitors that take the trouble to stop by. It’s a living, breathing thing that they can interact with. A stale Facebook account, for example, is the kiss of death. If you cannot keep up with all of those profiles, TAKE THE BUTTON OFF YOUR SITE. If you’re already using social network icons on your blog or site, you might consider putting sharing buttons on your pieces of content. Not all content is highly shareable – think from your readers’ point of view what they might like to share. With a bit more planning, you can schedule an event people might be interested in attending, and post about that event on your website. An interior designer friend of mine has Pinterest sharing buttons on her project pages with a focus on her “after” photos. This is the type of thing that people might like to share (if you bothered to make it interesting enough). Don’t underestimate your “email to a friend” link in this list. Although email has lost that certain “sexiness” to the younger generation, it’s versatile. For example, I can email an article to my Evernote account to add the idea to one of my notebooks. The easiest way is to look for some good plugins, if you have a WordPress-style blog. I am using “Social Share Buttons” by Loskutnikov Artem, which was rated very high by other WordPress users and I also saw that it was very recently updated. There are so many plugins to choose from – ask your web-savvy friends which ones they like, and don’t choose one that’s not updated very often, because outdated code can make your website vulnerable to malicious attacks. You might need to play with a few to see which you like. Be sure to “deactivate” each plugin you no longer need, and delete once you are sure you don’t need it. The obvious advantage of using a WordPress plugin is the ability to squeeze more icons into a smaller space and customize their appearance so they all match. Plus most plugins know how to fit within the parameters of a WordPress page, so it’s not as likely that you will accidentally break your website design by putting something in that’s too wide for the space. If you’re not going to use a WordPress plugin, you can still “grab the code” for social buttons on the social networks that you’d like to share. To find it, do a search for “like button” or “share button” along with the social network of your choice. You’ll want to place these in a widget or a box that allows HTML to be used. Most CMS’ will have a way to do this if you look around. Then make sure that the width needed for the Like or Share info does not exceed the widget or box you’ve allocated it to, or you’ll break your page design and push it all out of shape.